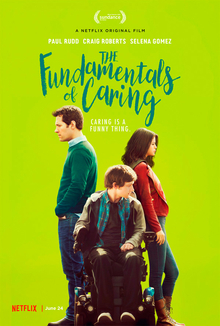 The Fundamentals of Caring is a 2016 American comedy-drama film written and directed by Rob Burnett, based on the 2012 novel The Revised Fundamentals of Caregiving by Jonathan Evison and stars Paul Rudd, Craig Roberts, and Selena Gomez. The film had its world premiere at the Sundance Film Festival on January 29, 2016 and was released by Netflix on June 24, 2016. Ben is a retired writer. Needing a new job, he takes a six-week course to become a caregiver. He gets a job from an English woman named Elsa, a registered caregiver and an office manager at a bank, whose 18-year-old son Trevor suffers from Duchenne muscular dystrophy. Trevor is a sardonic, anxious boy fascinated by American roadside attractions, and Ben suggests that they see several. Trevor initially refuses, and Elsa worries Ben is becoming too close to him. Trevor's father left when he was diagnosed, only sending him letters throughout the years. Ben is hounded by a court tracker hired by his wife and avoids his visits. Eventually, Elsa agrees with Ben's road trip plan, and he and Trevor embark on a journey to the world's deepest pit. On the way there, Trevor says he wants to see his father, who owns a car dealership in Salt Lake City. Stopping at a gas station, the two meet a girl Trevor's age named Dot, who Trevor develops a crush on. When they encounter her again at a diner later on, they see her attempting to hitchhike, and Ben gives her a ride. Dot informs them on the way that she is heading to Denver to restart her life, and that her mother has died. As the three bond, especially she and Trevor, Ben notices a car that has been following them. At a motel, Ben speculates it is someone sent by his wife. Further down the highway, the three find a pregnant woman named Peaches, whose car has broken down. She is heading to live with her mother before the baby comes, as the father is currently on his second U.S. military tour. They give her a ride. When they stop for the night, Trevor asks Dot on a date, and the two go to the diner across the street. Ben and Peaches watch through from the motel through the diner window and can see it is going well. The next day, the four arrive at Trevor's father's car dealership. Trevor's father stays distant and explains he never wrote him letters; it was his mother the whole time. Outraged, Trevor berates Ben and tells him he wishes to go home, but Dot insists they continue to the world's deepest pit. The group eventually arrive, in awe of the abyss. Trevor, Dot, and Peaches head to the bottom, but Ben notices the car that has been following them. He walks over and finds it is Dot's father, who wishes to make sure she is safe. Ben receives a call from Dot, who tells him to quickly come down. When he sees a crowd gathered at the bottom of the pit, he worries and finds Peaches has gone into labor. Despite being tormented by the memory of his son's death, he helps deliver the baby. Peaches thanks him as she and her newborn son are taken to the hospital. In the parking lot, Dot sees her father, walks up to him, and the two reconcile. When she comes back, she says she wishes to go the rest of the journey with her father. The three say their goodbyes, and Dot kisses Trevor before she leaves, promising they'll text. With the assistance of the ambulance staff, Trevor fulfills a wish of peeing standing over the pit railing. Ben and Trevor make it home safely, and having finally coped with the loss of his son, Ben meets his estranged wife and gives her the divorce papers. He continues writing, his next novel being about Trevor. He narrates his writing the last few lines, informing the audience that he eventually quit as Trevor's caregiver, but the two remained friends. On Trevor's 21st birthday, Ben went into his room to find Trevor lying dead on the floor and his new caregiver crying on the floor next to him, only to find out Trevor was faking. The caregiver quit the next day. On October 11, 2012, Worldwide Pants' Rob Burnett and Jon Beckerman acquired the film rights to Jonathan Evison's novel The Revised Fundamentals of Caregiving. Burnett would adapt and direct the film. On January 7, 2015, Paul Rudd was added to the cast to play the male lead, which Donna Gigliotti and James Spies would produce. On January 13, Selena Gomez also joined the film. On December 7, it was announced that the original title, The Revised Fundamentals of Caregiving, had been changed to The Fundamentals of Caring. It was later revealed Bobby Cannavale and Frederick Weller had been cast in the film. Filming began on January 22, 2015, in Atlanta, Georgia. In early February filming took place in Cartersville, Georgia. Filming concluded on February 26, 2015, after 26 days of filming. The film had its world premiere at the 2016 Sundance Film Festival as the Closing Night Film. In January 2016, prior to the film's premiere at the festival Netflix acquired global distribution rights to the film. It was released on Netflix on June 24, 2016. On Rotten Tomatoes the film has a rating of 78%, based on 32 reviews, with an average rating of 6.3/10. On Metacritic the film has a score of 55 out of 100, based on 10 critics, indicating "mixed or average reviews". ^ Robinson, Will (April 1, 2016). "Netflix sets June premiere date for The Fundamentals of Caring". Entertainment Weekly. ^ Osterndorf, Chris (June 24, 2016). "Review: Netflix's 'The Fundamentals of Caring' runs on Rudd". Retrieved July 18, 2017. ^ a b Siegel, Tatiana (October 11, 2012). "Worldwide Pants Nabs Big-Screen Rights to Jonathan Evison's Novel 'The Revised Fundamentals of Caregiving'". hollywoodreporter.com. Retrieved February 14, 2015. ^ Sneider, Jeff (January 7, 2015). "Paul Rudd to Star in Inspirational Indie Movie 'The Revised Fundamentals of Caregiving'". thewrap.com. Retrieved February 14, 2015. ^ Yamato, Jen (January 13, 2015). "Selena Gomez Joins Paul Rudd In 'The Revised Fundamentals of Caregiving'". Deadline Hollywood. Retrieved February 14, 2015. ^ "First Look at Paul Rudd, Craig Roberts & Selena Gomez in The Fundamentals of Caring". Final Reel. December 7, 2015. Retrieved December 7, 2015. ^ Berkshire, Geoff (January 23, 2016). "Sundance Film Review: 'The Fundamentals of Caring'". Variety. Retrieved May 30, 2016. ^ Tartaglione, Nancy (May 30, 2016). "'The Fundamentals Of Caring' Trailer: Paul Rudd, Craig Roberts & Selena Gomez Hit The Road". Deadline Hollywood. Retrieved May 30, 2016. ^ "Selena Gomez arrives in Atlanta to begin filming 'The Revised Fundamentals of Caregiving'". onlocationvacations.com. January 19, 2015. Retrieved February 10, 2015. ^ "On the Set for 1/26/15: Michael Fassbender Begins Steve Jobs Biopic, Ryan Coogler Starts Rocky Spinoff & More". ssninsider.com. January 26, 2015. Archived from the original on March 3, 2016. Retrieved February 10, 2015. ^ "Selena Gomez & Paul Rudd continue filming 'The Revised Fundamentals of Caregiving' in Cartersville, Georgia". onlocationvacations.com. February 2, 2015. Retrieved February 10, 2015. ^ "SUNDANCE INSTITUTE COMPLETES FEATURE FILM LINEUP FOR 2016 SUNDANCE FILM FESTIVAL". Sundance. December 7, 2015. Retrieved December 7, 2015. ^ Sharf, Zack (January 15, 2016). "Netflix Continues to Conquer Pre-Sundance With 'Fundamentals of Caring' Deal". Indiewire.com. Retrieved January 16, 2016. ^ "The Fundamentals of Caring (2016)". Rotten Tomatoes. Fandango Media. Retrieved March 7, 2018. ^ "The Fundamentals of Caring Reviews". Metacritic. CBS Interactive. Retrieved June 25, 2016. This page was last edited on 10 January 2019, at 12:37 (UTC).